Tom was born in Canada after his parents came from Hungary. He speaks fluent Hungarian and we had a nice chat (not in Hungarian) about second generation immigrants and languages here in Montreal. But, it was his girlfriend who turned him into a soccer fan. 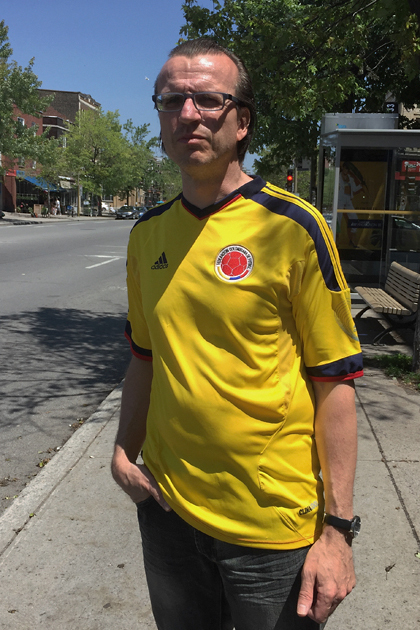 We agreed that Colombia has a very good team and had a nice showing at the last year’s World Cup. Tom is an artist doing illustrations, paintings and drawings. As I write this it’s halftime at the Women’s World Cup game between France and Colombia. Colombia is leading 1:0 and I imagine Tom and his girlfriend having a good time watching the game. Good day to you…haven’t been on your page in a little while. Thank you. The page was quite for a while. I hope there will be more posts coming.